I bake so much that it’s second nature. I don’t know what my kitchen wouldÂ look like without my stand mixer and various baking accessories. But to some, baking a cake can seem like an insurmountable task. Just look at any tv food reality show where the chefs complain about having to make a dessert: most of them pull it off, but not without acting as through they’ve been asked to run a marathon on short notice. They might be able to use a copy of Baking Unplugged, a cookbook that is intended to show you how simple and non-intimidating baking can be. The book is really an introduction to baking and it covers some basics that other books skip over. For instance, it tells you, item by item, what some of the basic tools you need to have in your kitchen for baking. This section only covers standard tools, not any special appliances or equipment, and these are all the things you need to make the recipes in the book. The idea, again, is to keep it simple and not to say “you can’t make this recipe because you don’t have the right tools.” The book also outlines basic baking ingredients, what you need to know about them and how to use them. It even discusses how to read a recipe – a skill that most of us are left to learn on our own. After the introduction is complete, the book moves on to the recipes themselves. There is quite a variety, and they are not all “beginner” recipes, in spite of what you may think coming into a basic baking book. There are cookies, cakes, pies and more, with recipes ranging from the easy Chewy-Crisp Chocolate Chip Cookies to a decadent Butterscotch Walnut Tart, which wouldn’t be out of place in any cookbook. 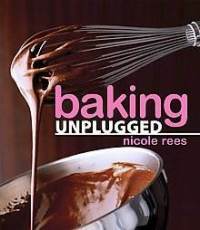 The recipes in Baking Unplugged are great for any level of baker, are easy to follow and offer a lot of interesting flavors. It’s the rest of the book that really makes this a good choice for those just starting out, or those that need a reminder that baking is supposed to be easy and fun. Thanks for introducing to us this book. Should be an interesting read. I like easy to follow books.